Greenland is a country like no other in the world. Being the world biggest island at 836.300 square miles, it is one of the least populated areas on earth with a mere 56.000 inhabitants, and 3/4th covered with a sheet of ice, while the rest consists mainly of rocky hills and mountains. This unique composition makes it both a harsh environment, with an infrastructure that is completely dependent on air transportation, as well as making the country one of the few places left on earth that has widespread areas of nature that is untouched by man. 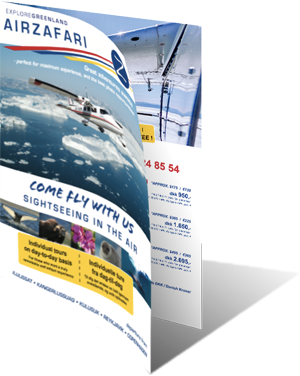 AirZafari offers a chance to get an up close and personal encounter of this breathtaking landscape with our sightseeing flights, taking you over the ice cap, glaciers, enormous icebergs, arctic tundras and deserts, and the wildlife associated with these. Unlike scheduled airline flights, we fly all of our tours at an ideal low altitude for the ultimate experience. Our top priority is safety and passenger comfort, and we take great care in providing our guests a smooth and steady flight, while focusing on bringing you an individual flight based on your wishes. Follow us on Instagram, and share your own experiences from your AirZafari flight!